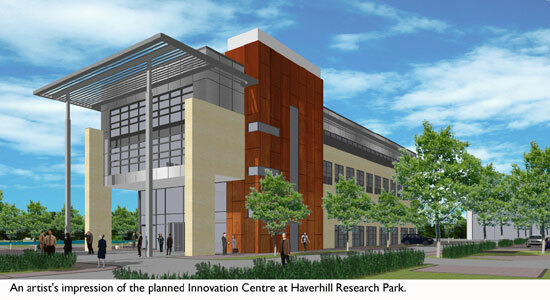 Haverhill Research Park’s plans for an innovation centre to act as the flagship development for the park have taken a major step forward this week. Carisbrooke Developments, the company behind the park, is branding the new project The Epicentre and is launching a ‘virtual innovation centre’ immediately, with incentives for businesses to sign up. The new address will be The Epicentre, Haverhill Research Park Three Counties Way, Haverhill, Suffolk, CB9 7FB. At the same time, the park has become a member of United Kingdom Business Incubation (UKBI), the leading organisation for individuals and organisations involved in enterprise, innovation, and sustainable growth. The planning application for the innovation centre goes to St Edmundsbury Council’s planning committee towards the end of May – which, if successful, could see the centre built by summer 2015 - but in the meantime businesses can take advantage of the ‘virtual’ offer that includes; use of the new innovation centre and address, a domain name, post handling and conference/meeting space at a reduced rate at the nearby Day’s Inn Hotel, where free Wi-Fi will also be available to virtual office tenants. Agents for the £100m park are Cheffins and Carter Jonas. Helen Chaplin is the park’s onsite sales representative.